Marlon Brando skates with Sandra Bezic during this scene from 1990's The Freshman, which was filmed in Toronto. Toronto’s Sandra Bezic is one of the most influential people in the competitive world of figure skating. She has played many roles: five-time Canadian Pairs champion with her brother Val, television commentator, producer, director, author, Emmy Award-winner for Stars on Ice, choreographer for three Olympic gold medalists and co-creator of Battle of the Blades. There is one unusual task Bezic remembers very well: personal skating coach to the legendary actor Marlon Brando for a scene in The Freshman (1990). It was the summer of 1989. Brando had not played the lead in a film for almost a decade. Producers “made him an offer he couldn’t refuse” and Brando showed up at Magder Studios on Pharmacy Avenue in Scarborough. Brando is considered by many to be the finest actor of his generation, nominated for eight Academy Awards and winning two Oscars for On the Waterfront (1954) and The Godfather (1972). In his prime Brando was a matinee idol, but by 1989 he wasn’t in any shape to be “a contender” in ice skating. 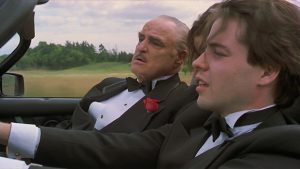 In The Freshman, Brando plays a self-parody of his gangster character Don Vito Corleone from The Godfather. The zany comedy has Toronto locations like U. of T. standing in for New York City and New Jersey. Brando had a reputation for being difficult, but Bezic found him “kind, charming, playful, a flirt, sometimes crude when his friend was around, and intuitive. We’d skate a lap around the rink then stand at the boards while he rested and told me all sorts of stories about his life”. Brando held the Hollywood studio bosses in contempt. He’d grown up as the only son of an alcoholic mother and a cold, distant father. Toward the end of filming Brando gave a rare interview with the Globe and Mail trashing the movie as “the biggest turkey of my career”. He wanted an extra $50,000 for overtime. News photos showed Brando in a neck brace from “a skating fall”. Roger Ebert praised “a superb comic performance…what astonishing grace he exhibited in an ice skating scene“. Rolling Stone extolled “one of the real pleasures” in the film was “watching Brando ice skating with surprising agility”. One critic singled out “a wonderful skating sequence in which he glides across the rink like a polar bear”. Bravo coach Bezic! In 2018 Bezic was inducted into the World Figure Skating Hall of Fame. Brando only made a few more films and died in 2004 at the age of 80. What could be more Canadian than ice skating? For those who are young at heart there is free skating for seniors (60+) Mondays and Thursdays 1:30 to 3 pm. at East York Memorial Arena. Take a spin for Bezic and Brando, maybe not contenders, but a class act!